Gallery / Saga Press, 9781481447942, 400pp. Set within a system of decaying world-ships travelling through deep space, this breakout novel of epic science fiction follows a pair of sisters who must wrest control of their war-torn legion of worlds—and may have to destroy everything they know in order to survive. Somewhere on the outer rim of the universe, a mass of decaying world-ships known as the Legion is traveling in the seams between the stars. Here in the darkness, a war for control of the Legion has been waged for generations, with no clear resolution. Zan wakes with no memory, prisoner of a people who say there are her family. She is told she is their salvation, the only person capable of boarding the Mokshi, a world-ship with the power to leave the Legion. But Zan’s new family is not the only one desperate to gain control of the prized ship. Zan finds that she must choose sides in a genocidal campaign that will take her from the edges of the Legion’s gravity well to the very belly of the world. In the tradition of Iain M. Banks’s Culture novels and Roger Zelazny’s Chronicles of Amber, Kameron Hurley has created an epic and thrilling tale about tragic love, revenge, and war as imagined by one of our most celebrated new writers. "In a universe where the word for spaceship is the same as for world, two women struggle to escape a perpetual war in this dystopic yet hopeful space opera. This gripping book is both hard to read and easy to appreciate." "One word will do it: Badass." "With mind-bending betrayals, heart-wrenching loves, souls and bodies driven to frenetic motion by war and hope, THE STARS ARE LEGION is a profoundly moving tale of self-discovery and self-construction in a world as wondrously layered as its unforge able protagonist." “So, this is chock full of action and fights and battles and betrayals and political intrigue. And those world-ships? They are all biological. Nothing in this fleet is built, it’s all birthed, and there are tentacles and blood and mucous and body fluids everywhere. It’s kind of awesome fun. You should totally read it." "A sweeping epic about a squad of starships—one that just happens to feature a cast of all female characters." "Grabs you like a gravity well and won’t let go. This is a dark, haunting, recursive tale, unlike any other space opera with which you’re familiar. Discovering Kameron Hurley’s work is like finding a whole new galaxy, and she is the star at its center." 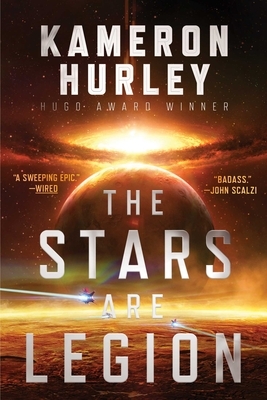 "The Stars Are Legion is like a magnificent storm tearing through the genre." "Hurley takes the reader on an exciting and at times breathtaking journey through the world of her creation. This novel is highly recommended for anyone looking for an inventive and engaging science fiction experience." "A visceral, optimistic mash-up of new, weird, and grimdark science fiction that is a cracking good read. Hurley has really leveled up." "The Stars Are Legion is poised to be Kameron Hurley's mainstream breakthrough, but apparently no one told her. It's unlike any space opera you’ve ever read—a bizarro blend of New Weird adventure, political thriller, and body horror; and an intimate examination of two deeply damaged women. It’s as visceral and violently angry as anything she's ever written, a ragged scream from the heart of a broken world—but one not past mending, if there are people brave enough to build a better one."